We hope to be able to load up some of the amazing histories of the Learmonth’s, the Wilsons and the Currie families – assuming Christine ever finishes the work she started a decade ago! Ercildoune was settled in 1838 by the Livingstone-Learmonth teenage brothers and became one of the most famous and widely renowned stations in Australia. The homestead construction is of massive blocks of granite stone cut by hand from a quarry close by. The Learmonth’s built most of the various outbuildings including the Gothic styled Managers House. Sir Samuel Wilson oversaw the construction of the 1-acre walled garden. And in the 1920’s Sir Alan Currie made further additions to outside parts, such as the servants quarters, adding a car garage to the stables, and importantly the Hydro Electricity system which is still largely intact albeit not in working order. The rams bred at Ercildoune became the basis for many of the best runs in the country and sale documents show huge prices being paid for Ercildoune rams throughout the width and breadth of the country. In 1873 when the Livingstone-Learmonths returned to Scotland after losing a well-documented court action, Ercildoune was sold to Sir Samuel Wilson. The sale price was reputed to be 236,000 pounds. The homestead portion was leased to Dame Nellie Melba whilst the Wilson Estate was being wound up. 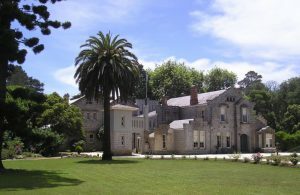 Sir Alan Currie purchased the property from the Estate of Sir Samuel Wilson in 1921. Thereafter it welcomed many famous visitors, including the Duke of Gloucester, who stayed there during his visit to Victoria in 1934. After Sir Alan Currie died, Lady Currie carried on the property, as well as she was able until she passed away. During her later years, the property fell into disrepair and much of the fabric of the place went ‘missing’. John & Christine Dever purchased Ercildoune in June 1999 and sold it in April 2014. in 1999 they found the Homestead and garden in a desperate situation requiring substantial restoration after having been virtually empty for decades. The homestead and other buildings are mostly constructed of granite with some handmade bricks made in kilns on the property, long since gone. The interior of the homestead was restored in 2000 with regards to hard plastering all walls, carpentry, plumbing and electrical. By 2014 it was as close to being what it was in its former glory days. Over the 15 years, John & Christine arranged restoration of most of the outbuildings and other parts of what was, in effect, a small township. The gardens themselves are now almost totally restored and redesigned with Christine’s hand and eye for perfection of shape and colour. We hand this legacy over to the new owners and ask that they take over the care and love we have for the place.